Xi Zhai - rhein-fine-musik-festivals Webseite! Xi Zhai’s piano playing is characterized by intense musical expression, extraordinarily cultivated touch, and brilliant technique, which is never used just for its own sake, but it completely serves the exploration of musical content, as intended by the composer. Xi Zhai’s extensive repertoire ranges from the Baroque and masters of the Classical and Romantic era to contemporary composers. His repertoire for piano and orchestra includes the complete piano concertos by Mozart, Beethoven, Brahms, Chopin, as well as works by Haydn, Schumann, Grieg, Tchaikovsky, Rachmaninov, Shostakovich and other composers. Xi Zhai was born in 1987 into a family of musicians in the Chinese province of Shanxi. He began playing the piano at the age of six and started his studies in 2001 with the distinguished piano teacher Dachun You in Shanghai. In 2002, Xi Zhai gave his first solo recital in his hometown of Taiyuan. 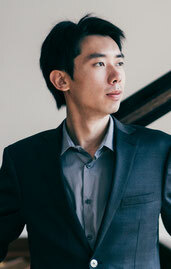 After his studies with Dr. Zhe Tang and his graduation at the Shanghai Conservatory of Music in 2009 he moved to Germany to continue his studies at the Frankfurt University of Music and Performing Arts in the master class of Prof. Joachim Volkmann, graduating in 2015 with a highly acclaimed concert exam. In addition to his piano playing, Xi Zhai is also active in chamber music, working with singers, and music for piano four-hands. He also studied rehearsal/coaching with Prof. Eugen Wangler, and orchestra conducting with Uwe Sandler. Several awards, such as the Gold Medal of the Toyama Piano Competition in Shanghai and the Silver Medal of the Asian Music Competition in Hong Kong were the beginning of Xi Zhai’s international concert career. In October 2013, Xi Zhai was awarded a scholarship of arteMusica for his outstanding musical achievements. Furthermore he participated in numerous master classes, among others with distinguished artists such as Elizabeth Leonskaja, Sir Andras Schiff, Paul Badura-Skoda, Prof. Helmut Deutsch, Prof. Fou Tsong, Prof. Yehoved Kaplinsky and Prof. Arie Vardi. Xi Zhai has performed in some of the most prestigious concert halls, such as in 2009 at the Grand Theatre in Beijing, and since 2011 he has performed several times at the ‘Alte Oper’ in Frankfurt, where he played for instance Johann Sebastian Bach’s monumental Goldberg-Variations. Xi Zhai has been featured as soloist with several orchestras in China and in Germany. He has performed with renowned conductors such as Karsten Januschke, Erich Wächter, Elahiu von Erlenbach, Chen Xieyang, Bian Zhushan, Chen Zuohuang, and Fu Renchang. Since April 2018 Xi Zhai holds a faculty position at the Frankfurt University of Music and Performing Arts.